Year after year, the thing I want most for my birthday isn't a thing: it's a good adventure. Last January, I was 7.5 months pregnant and I broke my no-travel-no-airlift vow in order to experience a blizzard in Yosemite, which was both terrifying and beautiful. 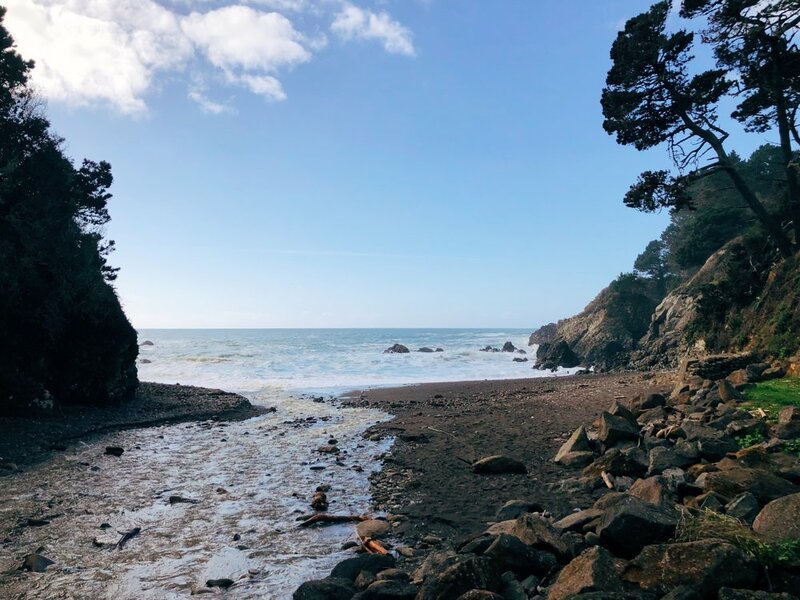 This year, I turned 32, and we drove four hours from home in a different direction, with two kids rather than one in the backseat, north along Highway One, to Mendocino and Fort Bragg. If you love beautiful things, California is like one huge candy store, and this trip was four days' worth of birthday presents. We explored a beach covered in sea glass rather than sand (from the days the city used to just push their trash off the cliffs). We followed a secret path through a cemetery to find a blowhole called Devil's Punchbowl, a 60' x 100' hole in the middle of the woods where the ocean waves broke through the cliff wall. We found our favorite cafe in Mendocino and grabbed to-go lunch there every day (you would, too, with the promise of huckleberry cheesecake). We inadvertently watched a big old house burn down (news said it was arson!). We saw glimpses of the winter migration, gray whales spouting in the distance. We explored quaint seaside towns, which we mainly had to ourselves because it was January and no one goes to the beach in January (and hotels are cheap!). 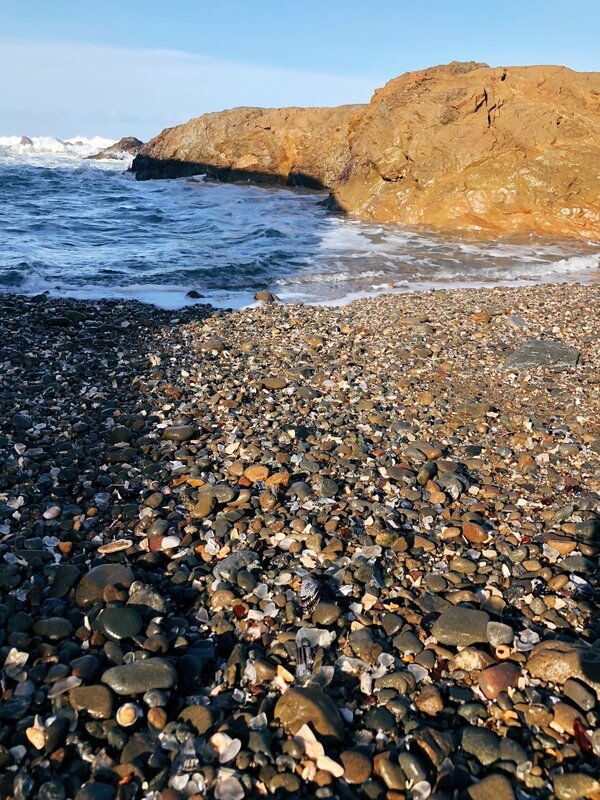 We found abalone shells in tide pools. We climbed the tallest lighthouse on the Pacific coast and braved the wind and rain on the catwalk while a storm raged. 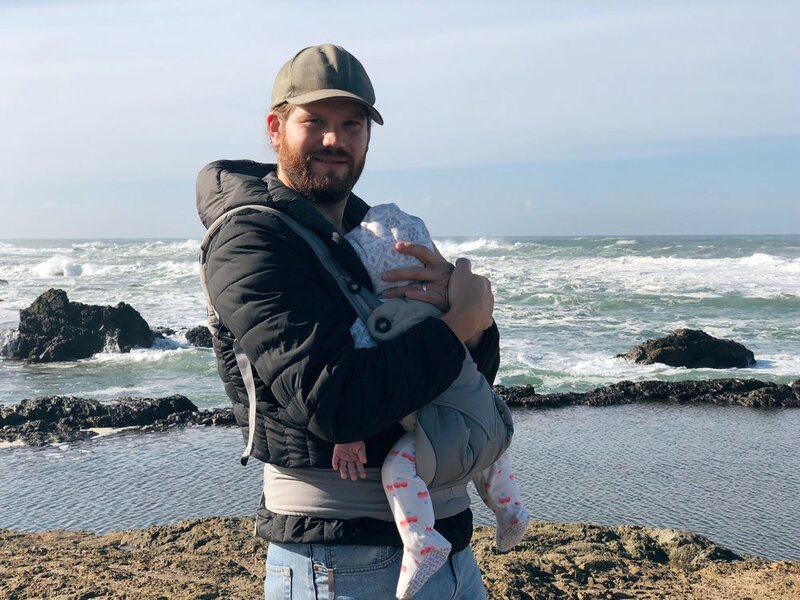 We drove a 150 mile stretch of CA-1, stopping to hunt for secret coves (me), splash in creeks (Sam), make Aeropress coffee in the back of the 4Runner (Jordan), and get the world's most scenic diaper change (Annie). 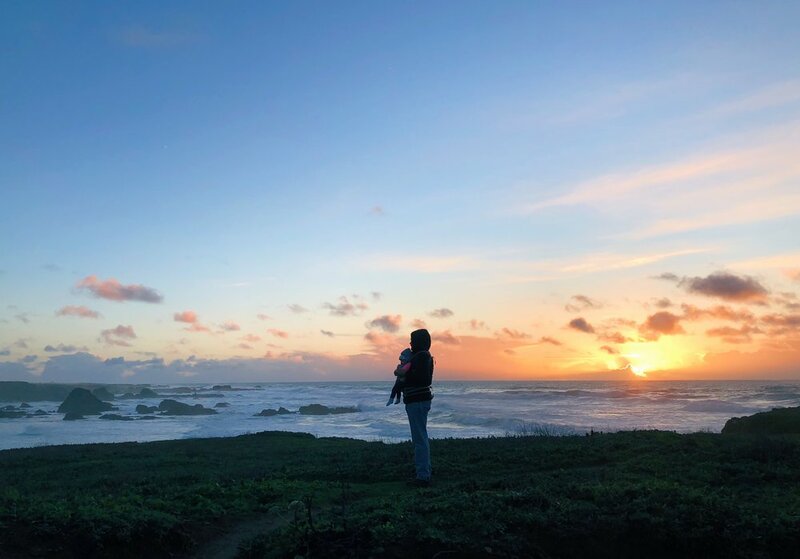 Yes, I know, it sounds completely idyllic, but then there were all the moments that weren't: trying to take a freezing cold windy sunset hike with a squirrelly 4 year old and displeased baby. Being exiled to the frigid hotel balcony every evening while the kids tried to go to sleep inside, passing a bottle back and forth to keep warm and eating birthday cake in the pitch dark. Taking turns jumping out of the car at scenic pull-offs (actually, mainly I was the one jumping out, because Jordan is a saint) and closing the car door oh so carefully so as not to wake the natives. Scrounging dinners from the cooler, including the pint of lentil soup that I spilled across the entire room (tipped the hotel maid extra, for that and for the crumbs. So many crumbs). Navigating four-year-old anxiety issues while on the go, bringing a mini white board schedule along to keep consistency. Here's the thing: the views are serene, provided you're just looking at the pictures, or wearing earplugs. Traveling the California coast with two tiny kids feels a lot like driving your circus train down Highway One: the wild animals are always a little restless. But it's getting easier. We didn't stop traveling when Annie was born--but it wasn't always fun. Now that we're nearly a year into it, and the kids have another year of travel experience down, it's actually starting to feel fun. I'm still learning tricks of the trade, like that it's always worthwhile to find a room with a view when traveling with kids, since you'll likely spend a lot of time there; that if you have the right gear, adventuring in the cold and rain isn't to be feared; that sneaking out alone for sunrise is the best way to get time to myself while on the road; and that you can save money and stress by eating nice lunches out and microwave dinners in. And, although Condé Nast will never tell you this, leftover birthday cake actually tastes best with wine straight from the bottle, eaten in secret with your husband while hiding from your kids on a windy hotel balcony. Here are a few pictures from our adventure, if you're curious...plus a Google map of the highlights!